Our shop, 20 minutes after the water stopped flowing. 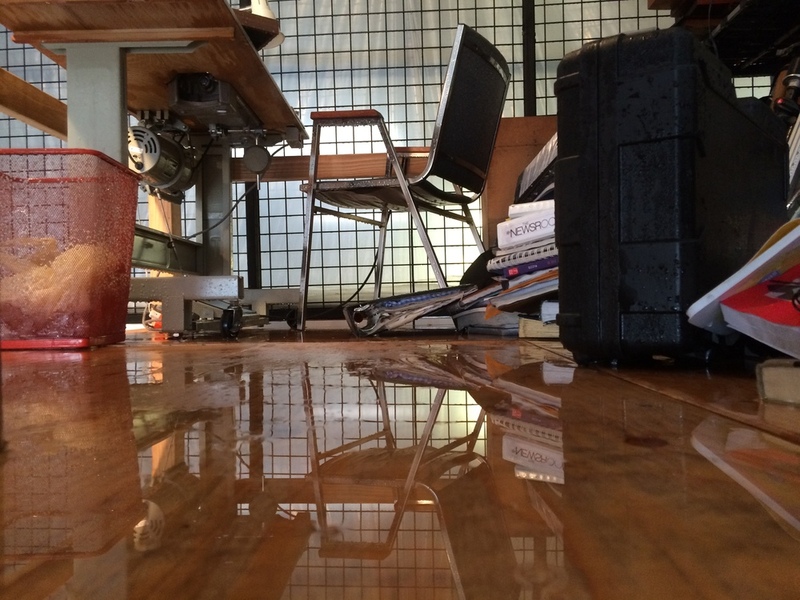 This morning, our shop was flooded due to a failure in the building's fire-retardant sprinkler system. Although we lost a day cleaning and taking inventory of our losses, we are still able to fill existing orders and new orders will be filled in the order they are received. Your order may be slightly delayed while we replace lost materials and address immediate concerns with property owners and insurance companies, and beg your patience if we do not respond as quickly to your inquiries. You may already be aware that we are in the process of moving into a new shop at 211 SE Madison St #3. We've been working around the clock to renovate the space, from electrical components for our tools to building loft space for a leather/fabric station and storage. Last night, we had the shop in good order and were excited to get to work making product! The universe, it seems, had other plans. 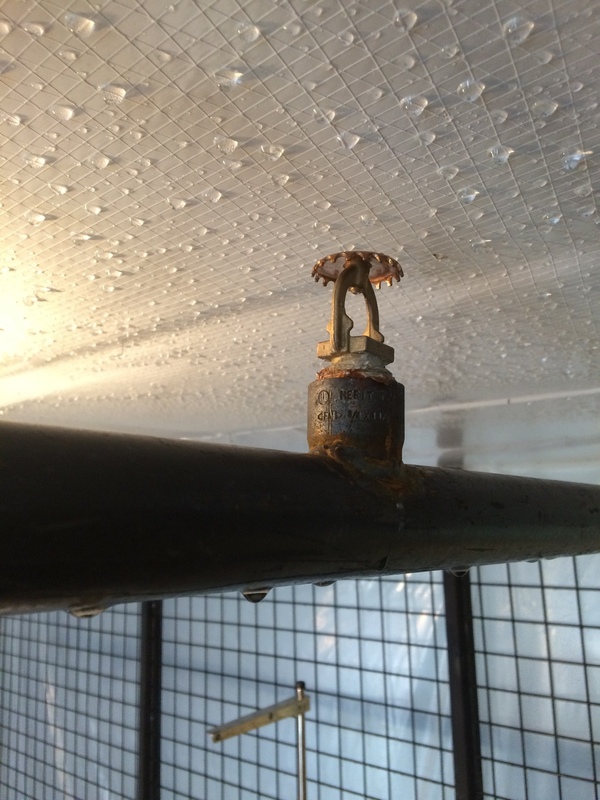 Early this morning, just after our arrival at the shop, the fire-retardant sprinkler system burst (only in our unit) and poured over 1,000 gallons of water in under 6 minutes, soaking our shop and everything in it. Picture the waterfall scene from Last of the Mohicans, but wetter and dirtier. The cause of the malfunction is unknown at this time. We spent the day cleaning, drying and taking stock of what we lost or could salvage. All 1000+ gallons of water flowed more-or-less seamlessly through our shop and into the building's enormous basement, so there is no standing water to deal with in our immediate sphere. But we're pretty sure a crocodile is hiding down there now that our maintenance man will have to deal with. All of our tools are quite hardy and operating smoothly. We expect to resume manufacturing in a day or two. +1 for American-made. Because we ship razors pretty much as soon as they are ready, we had very little stock in the shop to be damaged. We were even able to mail a few orders that were already sealed in plastic for shipping! Thanks to cloud-based data storage, all of our records are intact. The internet is really, really great. We now know that our finished scales are totally water-proof! They fared better than anything else in the shop. Our jeans cannot say the same. Portland Fire Dept. has an impressive sub-5-minute response time. SO much better than pizza delivery. We lost quite a bit, including exotic hardwoods, leather for strops, furniture, EVERYTHING paper, all of our packaging materials, and perhaps our greatest sentimental loss: Scott's entire vintage razor collection is now nice and rusty. All of our raw materials are sourced locally, so delays will be minimal and we don't expect any gaps in quality or availability. +2 for buying local! e have to deal with insurance companies and property managers. We won't be able to reorganize the whole shop until it is dehumidified, which will take several days. Because, mildew. Even though all our data files are cloud-based, our computers (and related electronics) are beyond saving. Did I mention we have to deal with insurance companies? Sorry if you are in the insurance business, but if you are, could you email us and remind us that some of you are cool? In the end, we had a pretty exciting day and aren't about to let a wee indoor monsoon, a la Jumanji, get us down. We are Portlanders, after all! We're also feeling very reassured, having seen how we respond in a crisis together. Thanks again for all your patience and support! We look forward to 2015 being our best year yet and can't wait to share our latest projects and new product with you!